GrabTaxi has been here since early this year but now it is officially launched to let people book for a taxi online. 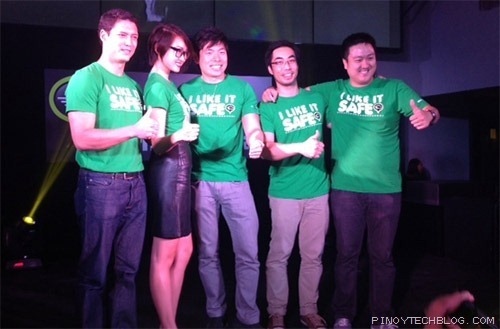 GrabTaxi is the first e-hailing company in the Philippines. It is a subsidiary of Malaysia’s MyTeksi, and uses smartphones to book a taxi in an efficient and safe manner. Right now, there are over 1000 taxi operators including some major taxi fleets that uses GrabTaxi. The service charges Php70 on top of the meter fare which is more expensive than the traditional call-a-cab’s plus Php50 rate. However, GrabTaxi is far more efficient and beneficial not only to passengers but also to the drivers and fleet operators. GrabTaxi screens operators and drivers to ensure that the vehicles used are in good condition and without any anomalies. They also conduct trainings to drivers not only for the use of the app and phone, but also for proper conduct and decorum when dealing with passengers. Here’s how it works which I personally tried earlier. With your Android or iPhone, download the free GrabTaxi app to register your details, actually just your name and mobile number. 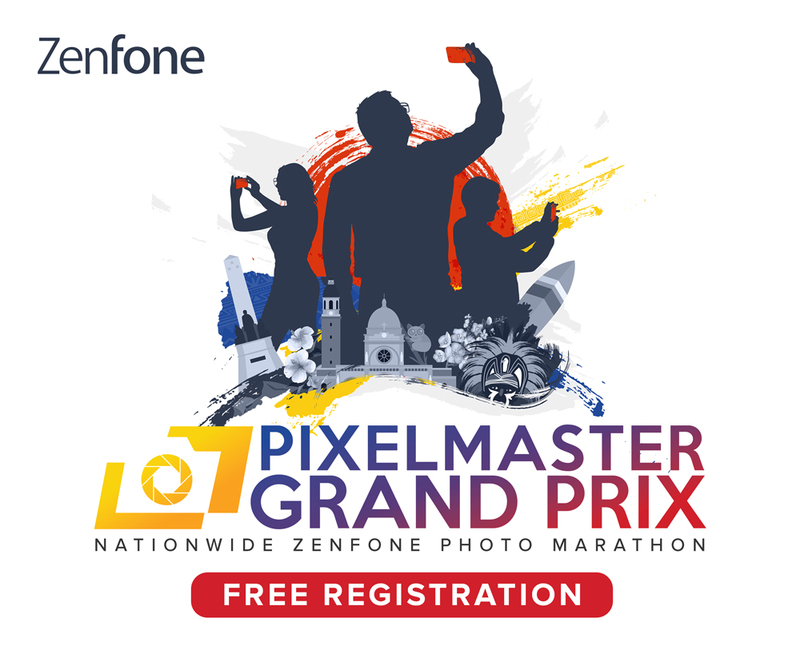 The app uses geo-location for your starting point but you can definitely change that. Input your destination, add some notes like the exact location or the color of our shirt, then click the Book Now and see the magic happens. Now each taxi driver is equipped with a CloudFone Android smartphone to process bookings. 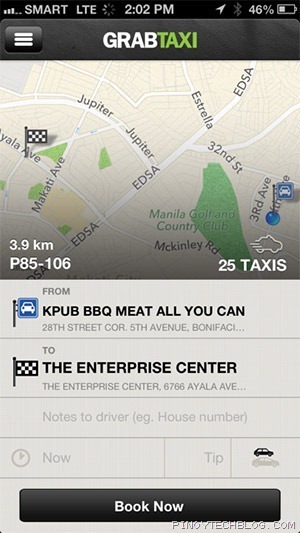 GrabTaxi will locate taxis that are available within 3km of your location and will flash your request to their device. Those who have no passengers can accept the booking but the app will award the request to the nearest taxi. 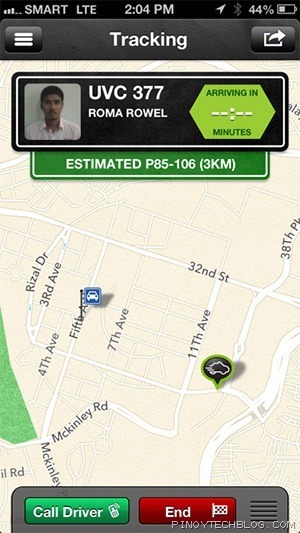 Once GrabTaxi matches you to a taxi, his info will display in your screen. You’ll see a photo of the driver, his name, the plate number of his taxi, and the estimated time of arrival. There’s also a Call button if you have further instructions for the driver. Since the driver also has GPS via his phone, you can see his location in your map so you’ll know when he’s near or not. Anyway, if you miss that, the driver can also press a button that will tell you that he’s in the location already. Cool huh? The meter will only start once you get inside the taxi. What’s also important to note here is that it will be easy to you to report wrongdoings or keep track of your history. For example if you left something, it will be easy for you to track the taxi driver. Of if you have a bad experience with the driver, a comment box will appear once the trip is completed so you can report the driver. You can leave a comment thanking him as well. You can also share your trip from the app via SMS, Twitter, Facebook, if you need to let other people know your whereabouts and the info on the taxi. What GrabTaxi essentially does is allow passengers to enjoy a safe, efficient and convenient way to call a cab, and also empower taxi drivers to be responsible and accountable for their actions. A majority of the Php70 goes to the taxi drivers and GrabTaxi, through the fleet operators, also give incentives to drivers who made a lot of successful trips and received good comments. It’s definitely a win-win situation for all stakeholders, not only to passengers and fleet operators. I tried this service twice today and had a smooth experience from pickup to arrival even if I was late to come down from my building and the taxi had to circle the block twice. Talking to my two taxi drivers, they also liked how GrabTaxi allow them to get additional income for every pickup. Right now, the app is only available for Android and iOS device but development for Windows and Blackberry is underway. In Malaysia, passengers can also book via web browser but it’s not yet available here. Also, GrabTaxi as of the moment, will only cover Metro Manila but once everything is ironed out then nearby provinces will come next. I don’t mind paying extra Php70 if it means I don’t have to wait in line for an hour, or have to deal with drivers asking for extra. Knowing where my taxi currently is allows me to do productive things before going out to wait. You can visit GrabTaxi’s website for more info, or follow them on Facebook, Twitter, and Instagram.